The people at Gurgle Baby Milestones have offered me three licenses to give away for their software. Let me tell you a little about how it works. The software can be installed on a PC or a Mac in a few minutes. Baby milestones helps you to learn about, keep track and organise all your family memories for the future and I have used information from their website to describe it quickly. You can add all the children that you already have, and you can also keep a trying to conceive. Many parents use scrapbooks, pieces of paper, photo albums and more to record things for the future, but the Gurgles has turned it into an easy to use permanent reminder. The software will give you relevant reminders and information to look out for and encourate at age and stages up to age 5. Babies start to laugh between 2-5 months of age. So when your baby is 2 months old, a reminder to look out for their first laugh will start to appear in the list. The first time you see a reminder, you’ll probably want to know more, so just click on the reminder. Then, one day, your baby will laugh for the first time – a wonderful moment you’ll probably want to capture! You can open up the reminder again and record exactly when they first laughed. If you’ve taken photos or video of one of their first laughs you can add these to the reminder, and you can record in the notes what triggered the laugh, where you were…in fact, anything you want to record. Then click “Turn into record” to permanently record all these things and when they happened. Now, your baby’s first laugh will be permanently recorded for you to look back on. You’ll no longer be reminded to look out for their first laugh, but don’t worry, there’ll be plenty more developments to look out for as your baby’s growth proceeds at an amazing pace! There are hundreds of reminders like this, covering both big and small milestones in your child’s development to 5 years of age. I didn’t have my children as very young babies, and using software like this might have given me something nice to look back on and remember. As it was, I faced three toddlers arriving at once. Sadly, taking pictures and keeping records fell by the wayside while I got to grips with being a mum. I truly regret that I was not organised enough to record everything, as the precious little time we have when our children are young flies by so quickly. You really wouldn’t think so, but you blink, and suddenly wake up one morning, ten years older. I have three licenses to give away. You can try the programme for free on the website, but I have licenses for the full software package to give away, each one worth £14.99. The winner will be chosen by random generator on the 24th December. Leave a comment to tell me that you want to enter. Leave me a way to contact you – either email or twitter id. 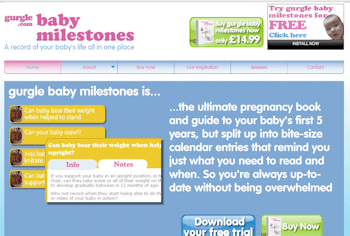 If you want to, you could tweet I want to win Gurgle Baby Milestones software with @scottish_mum at http://wp.me/p1aG8Y-W4. No pressure, you’ll still be entered if you don’t. please enter me in this fab comp. I’d love to win. What a great idea! I was good at writing things done initially but not kept it up! Yay, first entry. Twitter is quiet today. Everyone must be out shopping or enjoying themselves..